I don't know at what point director Kaneko Shusuke and writer Ito Kazunori decided that their makeover of Daiei's loopy turtle monster Gamera was going to be a trilogy, nor do I know if they had it in mind from the very beginning how they were going to end. But oh, how much 1999's Gamera 3: The Revenge of Iris (released three years after Gamera 2: Attack of Legion, for added build-up) feels like a conscious grand finale, every step of the way. It possess a grandeur and sense of monolithic scope far beyond that the daikaiju eiga genre would seem to be able to accomodate, let alone require. There are individual shots whose sense of immensity, dwarfing the humans included for scale, is enough to make you forget to breathe for a little bit: a specific perspective towards the film's end, from below Gamera and his foe Iris, is one of the best single images of giant monsters I think I've ever seen in a daikaija eiga or any other genre film, suggesting the colossal height and deadly weight of these creatures and making them seem much, much too real for big rubber suits. And that's not too long after a shot of the human characters looking down an immense pit of collapsed building, one of the best images at summing up the huge scale of destruction that these same creatures would be capable of producing that I'm familiar with in the annals of Japanese monster movies. I'm going to have to walk that back a little bit, because I'm starting to describe the best daikaiju eiga ever made, and I honestly don't thing that Revenge of Iris is even the best of the 1990s Gamera trilogy. 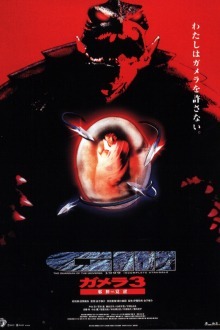 The story in Gamera: Guardian of the Universe is maybe a little bit tighter, and it has a more intoxicating build-up, while this final sequel has a graver and higher-impact series of climaxes. But I am honor-bound to admit that mostly, I'm just not all that fond of the Gamera redesign in this movie: he suddenly got all, like, spiny. In fact, it was only right in the act of typing that sentence that I figured out exactly my problem: he's suddenly turned into a live-action version of Bowser from the Super Mario franchise. Which, I get it, fire-breathing bipedal turtle with teeth, Bowser already was Gamera, basically. But this film pushes it to the point where apparently, after my subconscious happily smothered it for ten straight movies, I can't stop noticing it now. Anyway, that's a shamefully nitpicky reason to slag on a movie. Revenge of Iris is really damn good, whatever minor shortcomings here or there, and things it does well are unmatched by just about any other daikaiju eiga out there. In fact - Big Steaming Hyperbole alert - in terms of creating a compelling and driving human story, in which character psychology is a key element in the film's function and its impact, Revenge of Iris does things that out of its entire genre, I've only otherwise seen in the 1954 Godzilla, where the damned things got started in the first place. And that brings us to Iris's revenge, which I had always assumed was some sort of "ancient enemy of Gamera resurrected and looking for vengeance" deal, which isn't it at all (though the ancient enemy motif does crop up; to whet our appetites, the film first half includes Gamera versus a resurgent population of Gyaoses). In fact, the revenge is being wreaked by a teenage girl, Hirasaka Ayana (Maeda Ai), who witnessed the death of her parents four years earlier when they were collateral damage in Gamera's attack against the Gyaos threatening Japan at that point. She has, since then, harbored a much more intense feeling of hatred for the giant turtle than the government, which still hasn't decided if Gamera is a friend or foe (there is, happily, a little boy in a baseball cap who shows up long enough to clarify the point). And when Gamera returns to deal with the Gyaoses, killing a tremendous number of innocents in the process, it's more than Ayana can take. And it just so happens that her rage has a convenient outlet: she's been dazzled lately by a kind of stone egg in her local temple, and it hatches right about this time, revealing a sort of odd, vaguely squid-like critter with a kindly, cute expression, that forms a psychic bond with Ayana. Her bad luck: the thing, Iris, is a malevolent monster, growing at a fearsome rate, and it uses Ayana as its life source. This puts her in the center of a struggle between an anti-Gamera government agent, Asakura Mito (Yamazaki Senri), and our heroes from Gameras past, Gyaos-fighting ornithologist Nagamine Mayumi (Nakayame Shinobu), and Kusunagi Asagi (Fujitani Ayako), whose psychic link to Gamera is gone, but who still knows more about the giant turtle than anybody. There's real greatness in the film; not bad for anything involving a giant fire-breath monster, and particularly when it's part of the same geneology as Gamera: Super Monster. What I don't think it quite manages is being consistently great: some of the individual elements feel distinctly reheated (it's kind of hard to feel enthusiastic about a third consecutive film where the Japanese government would rather fight Gamera than his obviously more deadly opponent), some are forced (an explanation is given for why Japan uniquely attracts giant monsters, a question that I don't believe anybody had ever asked in the 45 years preceding this film's release), and generally speaking, the further we are from Ayana, the more generic the plotting becomes. Iris is a really solid monster that isn't especially memorable in any one way (certainly not after Legion), and while the filming of the action is beyond reproach, the specific choreography of the action is fine but not particularly special, until it starts to take a turn for the brutal near the end. But I don't know that any of that matters. The bar for daikaija eiga is not very high, but Revenge of Iris vaults over it without breaking a sweat or inconveniencing itself in the least. This really is one of the finest Japanese monster movies I have ever seen: nuanced in its story and character, bold in its visual dynamism, boasting some really great visual effects for the time and the industry; and unafraid to end on a more ambivalent note than literally any other daikaiju eiga I can name. It is a definitive statement, and if it's not perfect, it's still awfully damn impressive in every way.